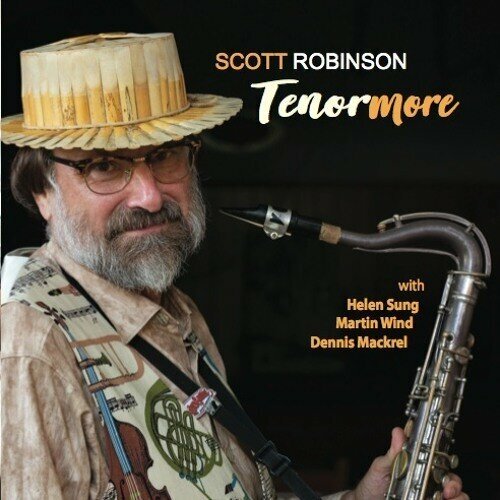 The hat Scott wears in the photo was designed by him and made from 177 of his used saxophone reeds. Some reviews almost write themselves; this is a prime example. 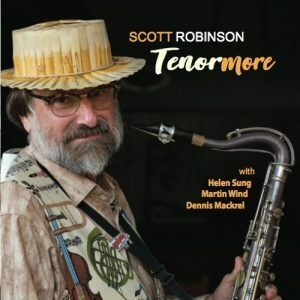 Scott Robinson has produced a CD about his longtime love affair with his 1924 Conn tenor saxophone. Excellent liner notes by longtime jazz author and critic, Doug Ramsey, also make this CD special for me. Robinson assembled an excellent small group which included Helen Sung on piano and Hammond B3; Dennis Mackrel on drums; and Martin Wind on string bass. Scott’s wife, Sharon, appears as special guest for one number on flute. About half the numbers are originals by Robinson with a lovely original Rainy River by bassist Martin Wind. Sanford Josephson, in his excellent book about Gerry Mulligan, tells the story about Mulligan’s papers and his baritone saxophone being deposited posthumously at the Library of Congress. Robinson was selected to play one number on Mulligan’s baritone saxophone at that ceremony. Scott brought his own mouthpiece and reed to use when he played Mulligan’s horn. In the transfer from rehearsal space to stage, an L of C assistant helped to transport the horn and set up on stage. Much to Scott’s anxiety and disappointment, Mulligan’s mouthpiece and 25 year-old cracked reed was on the horn; and, there was no time for Scott to rescue his own mouthpiece set-up. But, trooper that he is, Scott got through the piece satisfactorily. Tunes that most readers will recognize are Lennon and McCartney’s “And I Love Her,” “The Good Life,” and Hoagy Carmichael’s “The Nearness of You.” Bassist Martin Wind’s “Rainy River” has a lovely melody and the tenor sax and Wind’s bass blend marvelously. Scott’s original “The Weaver” is an excellent showpiece for a duet with wife Sharon’s flute. This CD should be especially appealing to reed players but also to the casual fan who likes good music. Thanks to all who helped make this CD possible, including Rachel Domber of Arbors Records. Scott gives special acknowledgment in the liner notes about her encouragement of the project.